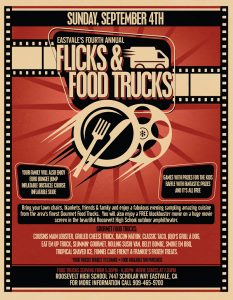 You’ve probably heard those food truck/movie mashup events in LA advertised on the radio. They sound like fun, right? Only problem is…you’re not in LA. Well, this weekend you’re in luck! There’s one happening right here in the Inland Empire on Sunday (September 4)…and it’s free! VantagePoint Church is hosting its fourth annual Eastvale Flicks & Food Trucks event from 5:30 to 9 p.m. at Eleanor Roosevelt High School at 7447 Scholar Way in Eastvale. 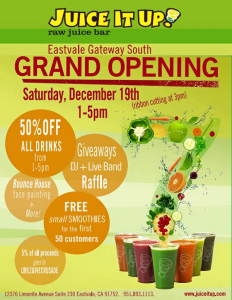 The recently-opened Eastvale Juice It Up! 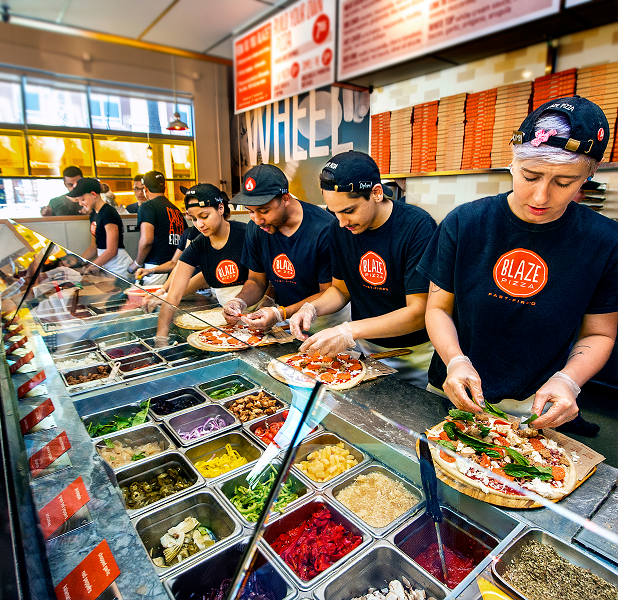 is hosting its grand opening from 1 to 5 p.m. on Saturday (December 19). The first 50 customers will receive a free small smoothie. In addition, all drinks will be half-price. There will be a ribbon-cutting ceremony with the Eastvale Chamber of Commerce at 3 p.m.
During the event, there will be giveaways and raffles for gift cards and Juice It Up! merchandise. Today (September 3) is a good day to be in the Inland Empire. Not only can you get free Pizza Bitz at three Inland Empire Wetzel’s Pretzels locations today, social media fans of Blaze Pizza (founded by Wetzel’s Pretzels co-founder Rick Wetzel and his wife Elise) can get a free pizza today at the chain’s new location in Eastvale. 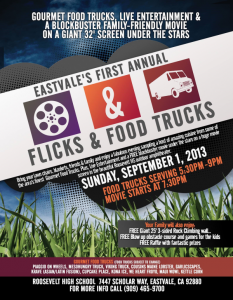 VantagePoint Church is sponsoring a free event in Eastvale tonight (September 1) that mixes food trucks, a family-friendly movie and other family activities. 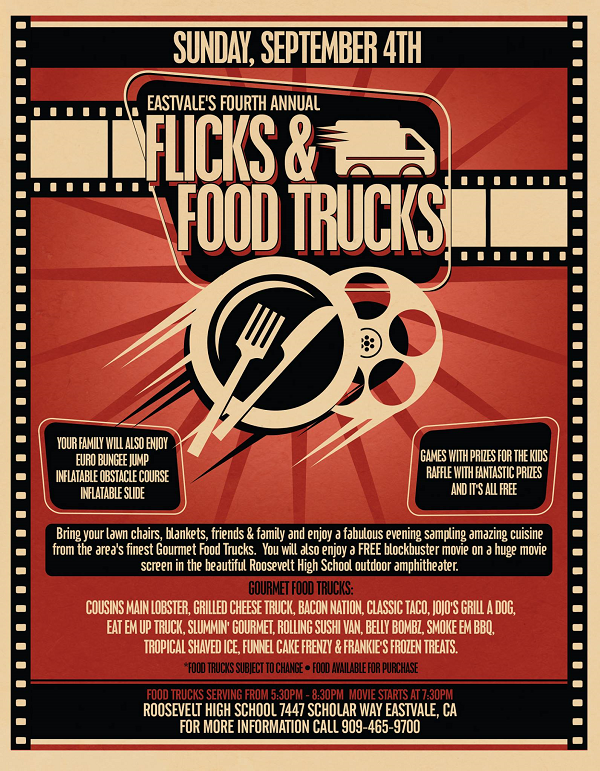 The “Flicks and Food Trucks” event kicks off at 5:30 p.m. and runs until 9 p.m. at Eleanor Roosevelt High School, 7557 Scholar Way. The as-yet-unnamed movie begins at 7:30 p.m. on a 32-foot outdoor screen. Quite a few trucks are scheduled to serve at the event. Head over the jump for a list. 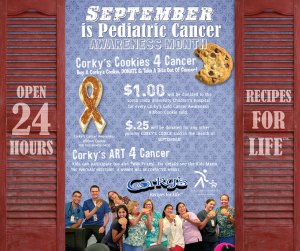 It seems like only yesterday I was driving by the empty lot in Eastvale where a new Corky’s Kitchen & Bakery was to be built. Actually, it was a little over ten months ago. I drove by again on Friday and discovered that the 24-hour restaurant was open! Then, I spotted on the Corky’s website that a fourth Inland Empire location is planned for Corona, at 3811 Bedford Canyon Road, Suites A8-A11. 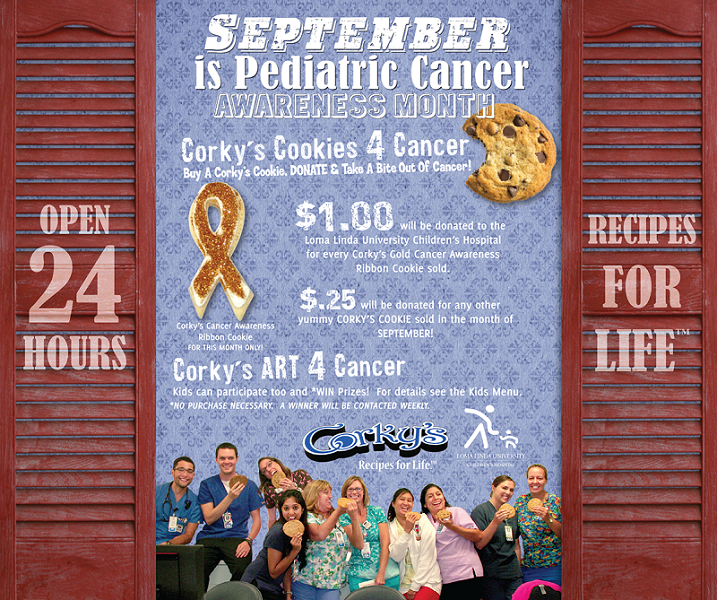 The Eastvale Corky’s, which joins locations in Rialto and Rancho Cucamonga, is at 12552 Limonite Ave, Suite 130. There’s also a non-I.E. location in Ladera Ranch.